A comprehensive vocational training for drivers enabling them to carry “in-scope” dangerous goods from all classes except Explosive and Radioactive. The course provides a solid grounding in basic legislation as it affects drivers and concentrates on vehicles carrying packaged dangerous goods. It covers a range of topics from: the duties of all parties involved; best practice and Health and Safety matters; types of packaging; safety equipment and class specific dangers. 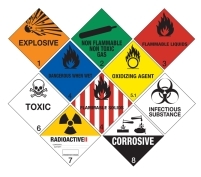 A complete course for drivers carrying only Radioactive or Explosive goods. A stand-alone one-day ADR Training course to add to an existing ADR qualification. Both subjects are very intensive and interesting and provide drivers with a sound understanding of the nature of radioactivity and the necessity for proper containment, and accompanying safety requirements; the nature of and types of explosives and the need for careful transport. A course designed for tanker drivers, covering the Core module, Tanks module and Class 2 or 3. The tanks module deals with the specifics of moving dangerous goods in tankers or tank containers and the skills involved. All courses are approved by the Scottish Qualifications Authority. Above costs are inclusive of course materials, administration and SQA examination fees (currently £20.00 per paper per candidate).